Developer Drastic Games has unveiled Soundfall – a rather nifty looking dungeon-roaming, rhythm-action adventure, due to release on PS4, Xbox One, PC, and Switch next year. Soundfall is the first project from the team at Drastic, which was founded by former members of Epic Games, and follows the adventures of protagonist Melody, on her quest to “stop the dark power of Discord” as she travels through the land of Symphonia. I’m going to assume this is unrelated to the popular chat room service. 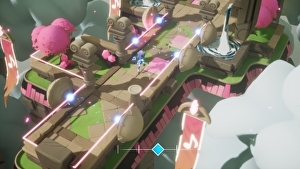 Regrettably, Drastic has revealed only very scant information about Soundfall at present, merely saying that it mixes “rhythm-based gameplay with twin-stick action for a harmonious dungeon-crawling experience”. The good news, however, is that the accompanying trailer gives a far better, and really rather promising, indication of how those elements might combine. Plus that’s some catchy music it’s got going on in there too.